Sequel to Gods Armorbearer Champions the local church and its leadership, focusing believers on the traditional, time-honored values of the local church. Reaffirms the place and position of the local church in our lives. Calls us to faithfulness to our local churches, pastors, leaders, and congregations in an effort to more effectively impact our local communities. - Publisher Terry Nance reaffirms the place and position of the local church in our lives. In a day of apathy and indifference, Nance calls us to faithfulness to our local churches, pastors, leaders, and congregations in an effort to more effectively impact our local communities. 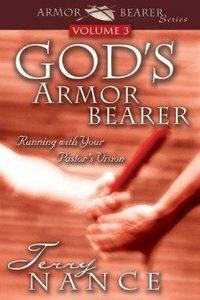 About "God's Armorbearer Volume 3"
Terry Nance reaffirms the place and position of the local church in our lives. In a day of apathy and indifference, Nance calls us to faithfulness to our local churches, pastors, leaders, and congregations in an effort to more effectively impact our local communities.